Why I do short term mission trips! I know some in the youth ministry world are against short term mission projects. They say things like the people don’t need your help, or if you don’t have a long term relationship nothing really changes. Going to some far off place is nice but you have needs in your community that should be served first. I have a different view on these types of trips. About a week ago I spent 8 days with students, parents and 300 other kids I had never met before to be the hands and feet of Jesus in the community of Prince George, Virginia. This is my 12th week long mission trip as a leader. I did 4 as a high school student and one trip for 3 weeks in high school as well. I can say without a doubt I am a week long mission junkie. I love it and honestly the couple of summers I didn’t get to do it my whole year felt off somehow. You may be thinking how can one week of service really do that. For the last 13 years I have gone on these trip through an organization called Group Mission trips. They are a fantastic organization to work with mostly because they do two things really well. First the work is all set up. They screen residents, plan the jobs we will be doing, and provide directions for all the projects. This is no small task. I have never in 13 years had an issues with work not needing to be done or trivial. We make a real difference in the lives of those people we come in contact with. Second they help my students and I get out of our comfort zone through breaking us up into crews of kids we have never met before. It is a brilliant system because if doesn’t just get you to meet other students. By taking you out of your comfort zone it helps students and adults to have confidence to get to know others in their own youth group. I cant say enough about the system and what they do. Lastly Mission trips like this put everything into perspective for me as a follower of Jesus. You see when you get to know a resident for a week you get to know them and their life story if you are willing to listen. You often hear stories of brokenness, death, and sin. You meet people who have never had anyone to listen to them, people who have never heard anyone care for them for no other reason that this guy named Jesus. It is truly a powerful experience. These experiences help put life in perspective for me. It helps me walk back into my community and have empathy for my neighbor. They help me see all people as if they were Jesus. So today as you walk around, take the time to hear your neighbor, hear the person who is next to you in line at the grocery story and care for them. Ask how you can help. Share about this Jesus guy who helps you get through this life. 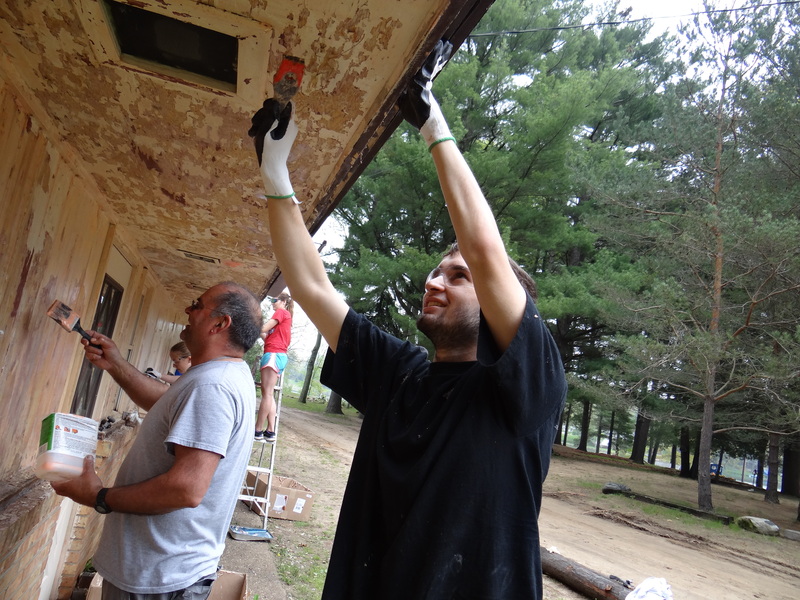 Stripping paint… How ministry can be tough when you don’t get to see the end of the project. 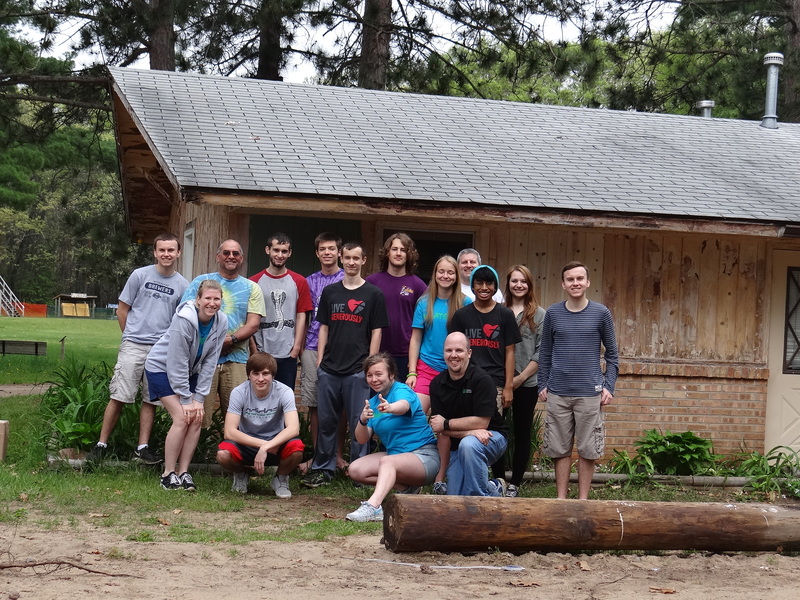 This past weekend I was on a retreat with High school students from Big Rapids, Muskegon, and Grand Rapids. I loved it. I loved talking about Christ with them and on the first night we spent talking about the term whatever. We focused on whatever we do, we do it for Jesus. If we hold the door open we do if for Jesus, If we clean up after dinner we do it for Jesus, If we scrape paint we do it for Jesus. We scraped a lot of paint. In fact when we arrived we had thought we would be painting. We came to finish this great project. Instead we spent 8 hours scraping one building. It was hard work. The building was build in 1957 and had at least 6 coats of paint on it. The process was spread paint remover goop on building, wait 30 minutes scrape, get off a layer or two, and repeat. If you waited too long it got dry and stopped working. At one point someone said “Wow this is hard work.” And I said “Yes and we are paying to do it!” It was hard and to be honest. I am not sure we all had the satisfaction of seeing a completely striped building ready for paint. Being the scraper of paint is tough work and not very satisfying. So I think scraping paint reminds a lot of being a disciple of Jesus. Sharing Jesus with students, friends, families, enemies and everyone in between is tough work. Sometimes when we spread the good news you don’t get to see it finished. even after you spend a lot of time on it. We would love for it to happen so quickly. We would love to be able to pray, talk and conversion happens. You don’t always get to see the beautiful building God is working them into. You see siding that looks beat up. You see the little bits of stubborn paint on a person that just isn’t wiped clean. Sometimes at the end of your time with the building, you don’t see the finished project just a building you worked on. I can be so frustrating. I tried to tell the students this weekend. This project isn’t complete. We did what God had planned for us to complete. We followed Jesus. We served and one day the whole project will be finished. It wasn’t our job to finish it was are call to start the project. As you think about that person, or family who needs to hear about Jesus, and are frustrated that the job isn’t done remember we all play a part and sometimes we don’t get to see the finish just are part of the process. I was hungry did you feed me? Jesus prepared our good works! 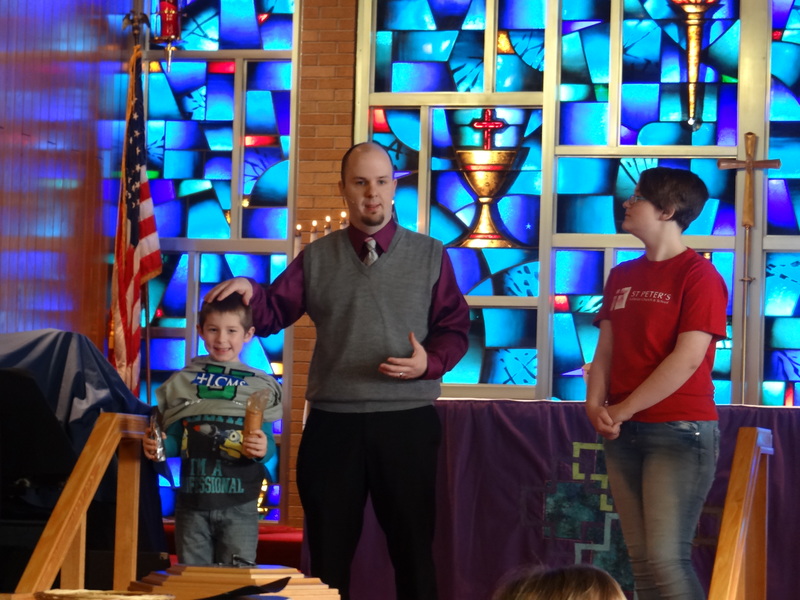 Today as I led chapel I was tasked with kicking off our Kids Against Hunger program here at St. Peters Lutheran Church. I was excited for this as I have been planning for almost 6 months the work we are going to do for this project. I am excited to see God at work through this project with families and our youth. Today, I also gave the message on Matthew 25:31-40 in chapel. I was reminded, as I was reading the text about the importance of the Gospel in Matthew 25. It is so easy with these verses to go strait to the law and guilt them into feeding the poor because that is what the Christians do. However when you read text closely I am reminded that even my good deeds are prepared for me by Jesus. You see I don’t do good because I am a good Christian. I do good because Christ is working through me. I do good because Jesus has prepared me to do good and is working through me to do good. So as we raise funds, pack meals and pray for those in our community and world who are hungry and in need of food I am excited at how God will use me and others. As we raise funds over the next month and April 23rd pack meals for the hungry children and families in our community and world we are reminded that our work here is about Jesus’ work through us. It is not about law or our work, but about what Jesus has done for us and through us. So I am asking those in my community to join us as we follow Jesus in the work he has prepared for us. For those of you in other communities what is Jesus leading you to do today and how can you be a part of it?